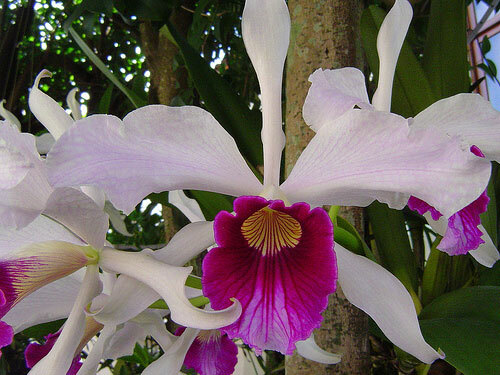 Laelia orchids have very showy, colorful flowers, usually pink or purple, leading orchid breeders often to hybridize them frequently with the closely related Cattleya orchid. Like Cattleyas, Laelias are sympodial epiphytes or lithophytes with one or two leaves at the top of each pseudobulb, and a single flower stem emerging from the sheath at the top of the pseudobulb. Caring for Laelias is also similar to caring for Cattleyas. There are 25 species in the genus, from Mexico and other parts of Central America. They vary a bit in habitat. L. albida, L. anceps, L. autumnalis, and L. speciosa like cooler temperatures because they come from high altitudes, and L. speciosa likes things a bit dryer than the rest, though most species are somewhat drought-tolerant if you're too lazy and/or forgetful to water them! Provide bright light, perhaps 3000-5000 footcandles. Direct sunlight is usually too much. If the leaves are dark green, there's not enough light; they should be more of a lighter, more yellowish green if there's enough light. Laelias like to dry out between waterings. Ideally, they'll dry out quickly after frequent waterings, so they are sometimes grown mounted on slabs of bark, which also allows plenty of air to the orchid's roots so evaporation is rapid. If you do that, you should water daily. Coarse fir bark also works well as a potting mix. They appreciate 50-70% humidity, particularly if grown mounted. Intermediate temperatures work well; try for day temperatures of 70-75°F (21-25C), with a drop of 10-15°F (6-8C) or more at night. Some of them need cooler nighttime temperatures to initiate blooming, though less so than Cymbidiums.